After reading a lot of blog posts, tweets on twitter, Facebook comments, and emails, I decided it was time to figure out the real decay behind the leveraged ETF's, both long and short. As I wrote about this in one of my previous blog posts, I wanted to revisit this issue of the double and triple leveraged ETF's, and why investor's should stay away from them, and to clear up some confusion. With the popularity of ETF's came these funds which use 200% and 300% leverage. Yes in any steady trend they can grow like weeds, but in a correction they will give back much of their gains. This is simple, and basic math. First of all, these are extremely risky, and investor's shouldn't hold on to any leveraged ETF(s) for the "long run", they are almost sure to lose money. These instruments are ideal for traders not investors! Second of all let's identify what a leveraged ETF does. A double leveraged ETF uses 200% (triple uses 300%) leverage to capture a specific basket, sector, or index move. Let's take the very popular SDS which is a 2X inverse tracking the S&P 500, for every 1% move up in the S&P 500 index SDS will move down by 2%, and for every 1% move down in the index SDS will move up by 2%. Similarly is the SSO which is the 2X tracking the S&P 500, for every 1% move up in the S&P 500 index SSO will move up by 2%, and for every 1% move down in the index SSO will move down by 2%. If you're the person who says: It's a great way to hedge my portfolio, so what's the problem with them? Then clear all your other thoughts and read this post carefully- it may save you some money. It's basic math that so many people overlook! Let's use the benchmark S&P 500 index for an example. Let's say we start off on the S&P 500 at 1000 and a double and triple leveraged ETF both at $100 per. If the benchmark index moves down 10% in 1 week to 900, and assuming both ETF's track perfectly it would put the double leveraged ETF at $80 per share, and the triple leveraged ETF at $70 per share. Here is where some investor's don't use those basic math skills they learned so many years ago, and assume that when the S&P gets back to 1000, the leveraged ETF will trade at the identical value as before, when the S&P was at 1000... THIS IS FALSE! Basic math tells us this is not possible. In order for the benchmark to get back to 1000 it will need to go up by 11.11% which will correlate to a 22.22% and 33.33% move in the double and triple ETF's respectively. As we can see in order to get the double leveraged ETF back to 100 from 80, the benchmark will need to increase by 12.5% correlating to a 25% increase in the double ETF. The triple leveraged ETF will need an even greater move to get back to 100. In order for the triple ETF to get back to 100 from 70, the benchmark will need to increase by 14.283% correlating to a 42.85% increase in the triple ETF. As you can see, for the past year the index is down 29.07%, the double short ETF up 6.8%, however the triple leveraged Short ETF is also down 20.11%. Many would have assumed the double and triple leveraged short ETF's would be up 58.14% and 87.21 respectively over this period. This is certainly not the case. These ETFs seem to decay over time, again this is proven with basic math! I will show you some scenarios in the following three tables. Scenario #1: The table below shows an index moving up by 1% on the first day, and down by 0.990099% on the following day. The same two day occurrence is repeated over 20 trading days (market moves exactly sideways over 20 trading periods). As you'll notice the index is back to even and all 4 of the leveraged ETF's are below their initial starting values, in just 2o trading days. Similarly this can be said if we reverse the order of the % changes, as in the first day the index goes down 1% and the follow day the index returns to the start by moving up by 1.0101%. The changes are insignificant over a 20 days period, but as you can see if the first day results in a loss versus a gain, the value of the ETF at the end of the 20 day period is a bit lower. Scenario #2: Let's say the market rallies 25.02% (1.5% a day for 15 days in a row), and then corrects 15.32% (from high) in the following 11 trading days (down 1.5% a day for 11 days). In the table below I will plot exactly this example, once again using basic math. As you can see the net gain for the index was 5.87%, however all 4 of the leveraged ETF's did not perform as they were suppose to. Note that this is only over 26 trading days about 10% of the trading year. You will also notice at the bottom of the spreadsheet I created, a simulation to show how the index (over the next 250 days) could get back to even the level it was at on July 11, 2008, and the resulting % changes from $100 per share for each leveraged ETF. This proves how dangerous they are... They are all down even when the index is back to even! 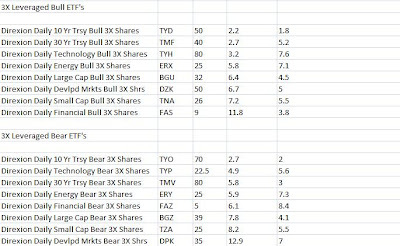 The question you may be asking me is: You blog about these ETF's all the time, don't you use them? My answer is absolutely, I actually prefer these to any given stock. This is because I am a trader of these instruments (not to mention young with high risk tolerance), and I use them for short covered call/naked put option strategies. The reason behind this is simply because they have such large premiums on the options, they can be used many different ways to create additional income for my portfolio. I do not think any investor should be in these, but I know many are. This post only talks about what I call the less risky of the leveraged ETF's, this is because I talk about the leveraged ETFs that track the indexes. Some of the most popular leveraged ETF's are ones that track specific sectors, like the super volatile: FAS, FAZ, SKF, UYG, TNA, TZA, URE, SRS, and many more. In conclusion, it certainly depends on the price these ETF's are purchased, but over the long run, based on simple mathematics, and the assumption that the market wont go in one direction forever, they are sure to deteriorate. This is why these are great instruments to trade, not invest. As promised in my last two posts, Alternate Short Strategy: Purchasing Put Protection for Less, and Alternate Short Strategy: Purchasing Put Protection for Less Part 2 I will be continuing my list of alternate ways to hedge your portfolio without shorting the stock. To conclude my list, in this post (part 3) I will be covering the stocks ranked from 36 to 50 on the list of 50 (ranked from greatest to least by market cap). To reiterate my two previous posts: I believe the market is due for a pull back, so it may be a good time to purchase put protection on some of your long positions. I decided to write about the 50 largest stocks (by market cap) in the S&P 500 and give a put protection strategy for each of them. To get a detailed spreadsheet of all 500 stocks, which will allow you to rank them based on their market cap minute by minute with the click of a mouse check out my blog post here. If you're coming across this post you most likely hold or at least have interest in a stock I'll be talking about shortly. In this article I will lay out 15 option ideas, which will help hedge your portfolio against the downside. These ideas all require using the Bear Put Option Spread Strategy. Therefore this post requires the knowledge of stock options, as I'll be talking about opening up a Bear Put Spread option position on each of the stocks listed. If you need help understanding options, or to learn more about opening up one of these positions (and options in general) click here. The puts purchased/sold in this post are for the August option expiration. The put being purchased is the strike price lower and closest to the current share price, and the put being sold is the next highest put available (below the put being purchased). All data as of market close Friday July 10, 2009. Put Option Strategy #36: Buy the CVS (CVS) August 30 put and sell the August 29 put. This strategy would cost $28 per contract to open, and gives you protection starting at 30 down to 29. The current probability the options market is factoring in that the option will close at or below 29 by August 22 is 19.1%. With 1 point strike increments on higher priced stocks, it may be worth to look into selling an even lower put. You'll have more at risk but you'll also have more protection. Put Option Strategy #37: Buy the Walt Disney (DIS) August 22 put and sell the August 21 put. This strategy would cost $35 per contract to open, and gives you protection of 4.5% starting at 22 per share on this stock. The current probability the options market is factoring in that this spread will be filled (meaning the stock closes at or below the lower strike price at expiration) is 29.7%. Put Option Strategy #38: Buy the 3M (MMM) August 60 put (currently in the money) and sell the August 55 put. This strategy would cost $180 per contract to open, and gives you protection of 8% per share on this stock (downside of 4.79 points on current stock value of 59.79). The current probability the options market is factoring in that this spread will be filled is 22.6%. Put Option Strategy #39: Buy the Gilead (GILD) August 44 put and sell the August 42.50 put. This strategy would cost $60 per contract to open, and gives you protection of 3.4% starting at 44 per share on this stock. The current probability the options market is factoring in that this spread will be filled is 32.1%. Put Option Strategy #40: Buy the Schering Plough (SGP) August 24 put and sell the August 22.50 put. This strategy would cost $42 per contract to open, and gives you protection of 6.25% starting at 24 per share on this stock. The current probability the options market is factoring in that this spread will be filled is 23.1%. Put Option Strategy #41: Buy the Monsanto (MON) August 70 put and sell the August 65 put. This strategy would cost $172 per contract to open, and gives you protection of 7.1% starting at 65 per share on this stock. The current probability the options market is factoring in that this spread will be filled is 23.3%. Put Option Strategy #42: Buy the Kraft (KFT) August 26 put and sell the August 25 put. This strategy would cost $40 per contract to open, and gives you protection of 3.9% starting at 26 per share on this stock. The current probability the options market is factoring in that this spread will be filled is 32.2%. Put Option Strategy #43: Buy the Bristol-Myers (BMY) August 19 put and sell the August 18 put. This strategy would cost $51 per contract to open, and gives you protection of 5.3% starting at 19 per share on this stock. The current probability the options market is factoring in that this spread will be filled is 24.6%. Put Option Strategy #44: Buy the Home Depot (HD) August 22.50 put and sell the August 21 put. This strategy would cost $58 per contract to open, and gives you protection of 6.7% starting at 22.50 per share on this stock. The current probability the options market is factoring in that this spread will be filled is 29.4%. Put Option Strategy #45: Buy the Eli-Lilly (LLY) August 32.50 put and sell the August 30 put. This strategy would cost $78 per contract to open, and gives you protection of 7.7% starting at 32.50 per share on this stock. The current probability the options market is factoring in that this spread will be filled is 20.6%. Put Option Strategy #46: Buy the Comcast (CMCSA) August 13 put and sell the August 12 put. This strategy would cost $35 per contract to open, and gives you protection of 7.7% starting at 13 per share on this stock. The current probability the options market is factoring in that this spread will be filled is 25.3%. Put Option Strategy #47: Buy the Medtronic (MDT) August 32.50 put and sell the August 31 put. This strategy would cost $55 per contract to open, and gives you protection of 4.6% starting at 32.50 per share on this stock. The current probability the options market is factoring in that this spread will be filled is 30.3%. Put Option Strategy #48: Buy the Colgate-Palmolive (CL) August 70 put and sell the August 65 put. This strategy would cost $135 per contract to open, and gives you protection of 7.1% starting at 70 per share on this stock. The current probability the options market is factoring in that this spread will be filled is 17.5%. Put Option Strategy #49: Buy the Altria (MO) August 16 put and sell the August 15 put. This strategy would cost $22 per contract to open, and gives you protection of 6.25% starting at 16 per share on this stock. The current probability the options market is factoring in that this spread will be filled is 15.3%. Put Option Strategy #50: Buy the Amazon (AMZN) August 75 put and sell the August 70 put. This strategy would cost $166 per contract to open, and gives you protection of 6.7% starting at 75 per share on this stock. The current probability the options market is factoring in that this spread will be filled is 25.2%. To reiterate my previous blog posts again: A general rule I like to follow is to sell the put contract about 7%-15% lower than the strike price of the put contract I purchased. The reason I like selling the spread when hedging my portfolio is because it allows me to hedge cheaper, and although it limits my downside protection, I believe it should protect the majority of the move lower. These options expire on August 22, 2009, therefore the last trading day is Friday August 21, 2009. As you can see on average the greater the protection the more expensive the contract is to open. If you're more bullish/bearish you’ll want to adjust the strike price accordingly. If you’re even more bearish, sell a put much lower than the one purchased, or don't sell a put at all. The cost will be more expensive to open the contract, however the downside protection will be greater. This strategy is a great way to hedge your portfolio. The reason option volumes have exploded over the past 5 years is because they are a great way to hedge your portfolio (see chart here). If you want to protect your overall portfolio, you may find another strategy I've been using more useful. By using option strategies on the double and triple short leveraged ETF's such as BGZ, FAZ, SDS, and SKF, I am able to hedge as well. See more details here. This post concludes the list of ideas which would help purchase put protection for cheaper on the list of the S&P 50. As promised in Alternate Short Strategy: Purchasing Put Protection for Less, I will be continuing my list of alternate ways to hedge your portfolio without shorting the stock. In this post (part 2) I will be covering the stocks from 21 to 35 on the list of 50 (ranked by market cap). To reiterate my previous post: I believe the market is due for a pull back, so it may be a good time to purchase protection on some of your long positions. I decided to write about the 50 largest stocks (by market cap) in the S&P 500 and give a put protection strategy for each of them. To get a detailed spreadsheet of all 500 stocks, which will allow you to rank them based on their market cap minute by minute with the click of a mouse check out my blog post here. All data as of market close Thursday July 9, 2009. Put Option Strategy #21: Buy the Philip Morris International (PM) August 42 put and sell the August 41 put. This strategy would cost $44 per contract to open, and gives you protection starting at 42 down to 41. The current probability the options market is factoring in that the option will close at or below 41 by August 22 is 35.3%. With 1 point strike increments on higher priced stocks, it may be worth to look into selling an even lower put. You'll have more at risk but you'll also have more protection. Put Option Strategy #22: Buy the Verizon (VZ) August 28 put and sell the August 27 put. This strategy would cost $32 per contract to open, and gives you protection of 3.6% starting at 28 per share on this stock. The current probability the options market is factoring in that this spread will be filled (meaning the stock closes at or below the lower strike price at expiration) is 27.7%. Put Option Strategy #23: Buy the Bank of America (BAC) August 12 put (currently in the money) and sell the August 11 put. This strategy would cost $45 per contract to open, and gives you protection of 8.1% per share on this stock (downside of 97 cents on current stock value of 11.97). The current probability the options market is factoring in that this spread will be filled is 32.7%. Put Option Strategy #24: Buy the Goldman Sachs (GS) August 140 put and sell the August 135 put. This strategy would cost $198 per contract to open, and gives you protection of 3.6% starting at 140 per share on this stock. The current probability the options market is factoring in that this spread will be filled is 33.9%. Note that on these higher priced, more volatile stocks it may be worth selling an even lower strike than the one indicated (such as the 130 or even 125). Put Option Strategy #25: Buy the Qualcomm (QCOM) August 43 put and sell the August 42 put. This strategy would cost $43 per contract to open, and gives you protection of 2.3% starting at 43 per share on this stock. The current probability the options market is factoring in that this spread will be filled is 47.2%. Put Option Strategy #26: Buy the Abbott Labs (ABT) August 45 put and sell the August 44 put. This strategy would cost $37 per contract to open, and gives you protection of 2.2% starting at 45 per share on this stock. The current probability the options market is factoring in that this spread will be filled is 33.2%. Put Option Strategy #27: Buy the McDonald's (MCD) August 57.50 (currently in the money) put and sell the August 55 put. This strategy would cost $111 per contract to open, and gives you protection of 3.1% starting at 56.77 per share on this stock. The current probability the options market is factoring in that this spread will be filled is 35%. Put Option Strategy #28: Buy the Schlumberger (SLB) August 50 put and sell the August 45 put. This strategy would cost $190 per contract to open, and gives you protection of 10% starting at 50 per share on this stock. The current probability the options market is factoring in that this spread will be filled is 25.1%. Put Option Strategy #29: Buy the Wyeth (WYE) August 45 put (currently in the money) and sell the August 40 put. This strategy would cost $88 per contract to open, and gives you protection of 5.3% starting at 44.89 per share on this stock. The current probability the options market is factoring in that this spread will be filled is 26.7%. Put Option Strategy #30: Buy the ConocoPhillips (COP) August 40 put and sell the August 39 put. This strategy would cost $46 per contract to open, and gives you protection of 2.5% starting at 40 per share on this stock. The current probability the options market is factoring in that this spread will be filled is 39%. Put Option Strategy #31: Buy the Amgen (AMGN) August 57.50 put and sell the August 55 put. This strategy would cost $93 per contract to open, and gives you protection of 4.3% starting at 57.50 per share on this stock. The current probability the options market is factoring in that this spread will be filled is 31%. Put Option Strategy #32: Buy the Merck (MRK) August 27 put and sell the August 26 put. This strategy would cost $43 per contract to open, and gives you protection of 3.7% starting at 27 per share on this stock. The current probability the options market is factoring in that this spread will be filled is 37.7%. Put Option Strategy #33: Buy the Occidental Petroleum (OXY) August 60 put and sell the August 55 put. This strategy would cost $165 per contract to open, and gives you protection of 8.3% starting at 60 per share on this stock. The current probability the options market is factoring in that this spread will be filled is 24.2%. Put Option Strategy #34: Buy the UPS (UPS) August 50 put (currently in the money) and sell the August 45 put. This strategy would cost $240 per contract to open (already $198 in the money), and gives you protection of 6.3% starting at 48.02 per share on this stock. The current probability the options market is factoring in that this spread will be filled is 30.9%. Put Option Strategy #35: Buy the United Technologies (UTX) August 50 put (currently in the money) and sell the August 45 put. This strategy would cost $180 per contract to open, and gives you protection of 9.4% starting at 49.65 per share on this stock. The current probability the options market is factoring in that this spread will be filled is 22%. To reiterate my previous blog post again: A general rule I like to follow is to sell the put contract about 7%-15% lower than the strike price of the put contract I purchased. The reason I like selling the spread when hedging my portfolio is because it allows me to hedge cheaper, and although it limits my downside protection, I believe it should protect the majority of the move lower. If you want to protect your overall portfolio, you may find another strategy I've been using more useful. By using option strategies on the double and triple short leveraged ETFs such as BGZ, FAZ, SDS, and SKF, I am able to hedge as well. See more details here. Part 3 will be ready after market close Friday July 10, 2009. As recently posted on my blog I believe the market is due for a pull back, so it may be a good time to purchase protection on some of your long positions. I decided to write about the 50 largest stocks (by market cap) in the S&P 500 and give a put protection strategy for each of them. This is the first part of three which I'll be including 20 stocks in this analysis and 15 in each of the next two. The stocks will be listed in order from largest to smallest market cap. The 20 stocks used in this article are the stocks with the current highest market cap in the S&P 500. To get a detailed spreadsheet of all 500 stocks, which will allow you to rank them based on their market cap minute by minute with the click of a mouse check out my blog post here. If you're coming across this post you most likely hold or at least have interest in a stock I'll be talking about shortly. In this article I will lay out 20 option ideas, which will help hedge your portfolio against the downside. These ideas all require using the Bear Put Option Spread Strategy. All data as of market close Wednesday July 8, 2009. Put Option Strategy #1: Buy the Exxon Mobil (XOM) August 65 put and sell the August 60 put. This strategy would cost $124 per contract to open, and gives you protection starting at 65 down to 60 over the next 44 days. Put Option Strategy #2: Buy the Microsoft (MSFT) August 22 put and sell the August 21 put. This strategy would cost $36 per contract to open, and gives you protection starting at 22 down to 21 over the next 44 days. Put Option Strategy #3: Buy the Wal-Mart (WMT) August 47.50 put and sell the August 45 put. This strategy would cost $76 per contract to open, and gives you protection starting at 47.50 down to 45 over the next 44 days. Put Option Strategy #4: Buy the Johnson & Johnson (JNJ) August 55 put and sell the August 50 put. This strategy would cost $75 per contract to open, and gives you protection starting at 55 down to 50 over the next 44 days. Put Option Strategy #5: Buy the Procter & Gamble (PG) August 52.50 put and sell the August 50 put. This strategy would cost $95 per contract to open, and gives you protection starting at 52.50 down to 50 over the next 44 days. Put Option Strategy #6: Buy the AT&T (T) August 23 put and sell the August 22 put. This strategy would cost $31 per contract to open, and gives you protection starting at 23 down to 22 over the next 44 days. Put Option Strategy #7: Buy the IBM (IBM) August 100 put and sell the August 95 put. This strategy would cost $151 per contract to open, and gives you protection starting at 100 down to 95 over the next 44 days. Put Option Strategy #8: Buy the Google (GOOG) August 400 put and sell the August 390 put. This strategy would cost $430 per contract to open, and gives you protection starting at 400 down to 390 over the next 44 days. In terms of % protecting to the downside it is very low, therefore I would look at selling a spread as low as 370 for Google. A 400/370 put spread on Google would cost $1075. Put Option Strategy #9: Buy the Chevron (CVX) August 60 put and sell the August 55 put. This strategy would cost $128 per contract to open, and gives you protection starting at 60 down to 55 over the next 44 days. Put Option Strategy #10: Buy the JP Morgan (JPM) August 32 put and sell the August 31 put. This strategy would cost $41 per contract to open, and gives you protection starting at 32 down to 31 over the next 44 days. With 1 point strike increments on higher priced stocks, it may be worth to look into selling an even lower put. You'll have more at risk but you'll also have more protection. Put Option Strategy #11: Buy the Apple (AAPL) August 135 put and sell the August 130 put. This strategy would cost $196 per contract to open, and gives you protection starting at 135 down to 130 over the next 44 days. Like the Google idea listed above, it may be worth it to check out the Apple 125 put instead. Put Option Strategy #12: Buy the General Electric (GE) August 10 put and sell the August 9 put. This strategy would cost $22 per contract to open, and gives you protection starting at 10 down to 9 over the next 44 days. Put Option Strategy #13: Buy the Coca Cola (KO) August 47.50 put and sell the August 45 put. This strategy would cost $70 per contract to open, and gives you protection starting at 47.50 down to 45 over the next 44 days. Put Option Strategy #14: Buy the Cisco (CSCO) August 18 put and sell the August 17 put. This strategy would cost $37 per contract to open, and gives you protection starting at 18 down to 17 over the next 44 days. Put Option Strategy #15: Buy the Oracle (ORCL) August 20 put and sell the August 19 put. This strategy would cost $33 per contract to open, and gives you protection starting at 20 down to 19 over the next 44 days. Put Option Strategy #16: Buy the Pfizer (PFE) August 14 put and sell the August 13 put. This strategy would cost $28 per contract to open, and gives you protection starting at 14 down to 13 over the next 44 days. Put Option Strategy #17: Buy the Wells Fargo (WFC) August 22 put and sell the August 21 put. This strategy would cost $42 per contract to open, and gives you protection starting at 22 down to 21 over the next 44 days. Put Option Strategy #18: Buy the Intel (INTC) August 15 put and sell the August 14 put. This strategy would cost $26 per contract to open, and gives you protection starting at 15 down to 14 over the next 44 days. Put Option Strategy #19: Buy the Hewlett-Packard (HPQ) August 36 put and sell the August 35 put. This strategy would cost $33 per contract to open, and gives you protection starting at 36 down to 35 over the next 44 days. Note that this is similar to the JP Morgan idea listed above and selling a lower strike than the indicated one should be considered for greater protection. Put Option Strategy #20: Buy the Pepsi (PEP) August 55 put (currently in the money by 15 cents) and sell the August 52.50 put. This strategy would cost $95 per contract to open, and gives you protection starting at 55 down to 52.50 over the next 44 days. A general rule I like to follow is to sell the put contract about 7%-15% lower than the strike price of the put contract I purchased. The reason I like selling the spread when hedging my portfolio is because it allows me to hedge cheaper, and although it limits my downside protection, I believe it should protect the majority of the move lower. In my humble opinion, I don't expect the stocks mentioned above to decline by more than 15% by the August expiration - however we all know they could. As recently charted in my blog post here I believed and still believe the market is due for a correction. The chart is a clear head and shoulders pattern of the S&P 500 SPDR (SPY). Some of the ways I've been hedging my portfolio, is by using the leveraged short ETF's. One strategy I have been using on these short ETF's is the Buy/Write option strategy, which hedges my overall portfolio on the downside, and also gives me protection in case the market moves higher. You'll need to understand options in order to consider the ideas discussed below. To learn about opening and closing these positions and options in general check out my option trading E-Books here. All data is as of market close Tuesday July 7, 2009. Buy/Write Option Strategy #1: Buy the UltraShort Basic Materials ProShares (SMN) ETF and sell the July 22.50 call option. Assuming you get called away this will return 7.4% in 10 days. If you don't get called away the premium received gives you a 4% downside protection. Buy/Write Option Strategy #2: Buy the UltraShort DJ-AIG Crude Oil ProShares (SCO) ETF and sell the July 22 call option. Assuming you get called away this will return 8.4% in 10 days. If you don't get called away the premium received gives you a 3.5% downside protection. Buy/Write Option Strategy #3: Buy the UltraShort Dow 30 ProShares (DXD) ETF and sell the July 54 call option. Assuming you get called away this will return 6.4% in 10 days. If you don't get called away the premium received gives you a 1.6% downside protection. Buy/Write Option Strategy #4: Buy the UltraShort Financials ProShares (SKF) ETF and sell the July 49 call option. Assuming you get called away this will return 9.2% in 10 days. If you don't get called away the premium received gives you a 3% downside protection. Buy/Write Option Strategy #5: Buy the UltraShort Gold ProShares (GLL) ETF and sell the July 15 call option. Assuming you get called away this will return 1.6% in 10 days. If you don't get called away the premium received gives you a 4.2% downside protection. This is a deflationary hedge, however I am more concerned about longer term inflation. A good way to hedge against long term inflation is the GOLD SPDR (GLD). Buy/Write Option Strategy #6: Buy the UltraShort Industrials ProShares (SIJ) ETF and sell the July 50 call option. Assuming you get called away this will return 6.1% in 10 days. If you don't get called away the premium received gives you a 3.1% downside protection. Buy/Write Option Strategy #7: Buy the UltraShort Oil & Gas ProShares (DUG) ETF and sell the July 22 call option. Assuming you get called away this will return 5.5% in 10 days. If you don't get called away the premium received gives you a 3.8% downside protection. Buy/Write Option Strategy #8: Buy the UltraShort QQQ ProShares (QID) ETF and sell the July 37 call option. Assuming you get called away this will return 6.6% in 10 days. If you don't get called away the premium received gives you a 2.1% downside protection. Buy/Write Option Strategy #9: Buy the UltraShort Real Estate ProShares (SRS) ETF and sell the July 22.50 call option. Assuming you get called away this will return 8.7% in 10 days. If you don't get called away the premium received gives you a 4.2% downside protection. Buy/Write Option Strategy #10: Buy the UltraShort Russell 2000 ProShares (TWM) ETF and sell the July 49 call option. Assuming you get called away this will return 7.4% in 10 days. If you don't get called away the premium received gives you a 2.6% downside protection. Buy/Write Option Strategy #11: Buy the UltraShort S&P 500 ProShares (SDS) ETF and sell the July 63 call option. Assuming you get called away this will return 6.7% in 10 days. If you don't get called away the premium received gives you a 2% downside protection. Buy/Write Option Strategy #12: Buy the UltraShort Semiconductor ProShares (SSG) ETF and sell the July 40 call option. Assuming you get called away this will return 8.8% in 10 days. If you don't get called away the premium received gives you a 2.2% downside protection. Buy/Write Option Strategy #13: Buy the UltraShort Technology ProShares (REW) ETF and sell the July 45 call option. Assuming you get called away this will return 4.7% in 10 days. If you don't get called away the premium received gives you a 1.5% downside protection. Buy/Write Option Strategy #14: Buy the Direxion Daily Devlpd Mrkts Bear 3X Shares (DPK) ETF and sell the July 40 call option. Assuming you get called away this will return 17.6% in 10 days. If you don't get called away the premium received gives you a 4.9% downside protection. Buy/Write Option Strategy #15: Buy the Direxion Daily Energy Bear 3X Shares (ERY) ETF and sell the July 30 call option. Assuming you get called away this will return 13.5% in 10 days. If you don't get called away the premium received gives you a 3.6% downside protection. Buy/Write Option Strategy #16: Buy the Direxion Daily Financial Bear 3X Shares (FAZ) ETF and sell the July 6 call option. Assuming you get called away this will return 14.7% in 10 days. If you don't get called away the premium received gives you a 3.3% downside protection. Buy/Write Option Strategy #17: Buy the Direxion Daily Large Cap Bear 3X Shares (BGZ) ETF and sell the July 42 call option. Assuming you get called away this will return 8.8% in 10 days. If you don't get called away the premium received gives you a 3.4% downside protection. Buy/Write Option Strategy #18: Buy the Direxion Daily Small Cap Bear 3X Shares (TZA) ETF and sell the July 30 call option. Assuming you get called away this will return 18.5% in 10 days. If you don't get called away the premium received gives you a 2.4% downside protection. Buy/Write Option Strategy #19: Buy the Direxion Daily Technology Bear 3X Shares (TYP) ETF and sell the July 25 call option. Assuming you get called away this will return 6.8% in 10 days. If you don't get called away the premium received gives you a 3.9% downside protection. These options expire in 10 days (July 18, 2009) therefore the last trading day is Friday July 17, 2009. As you can see the greater the return, the lower the downside protection. I used a more bearish scenario based on the higher strike prices, in the case the option expires out of the money I just write it out for a similar strike for the next month. These ETF's bring very high premiums, but in my opinion should not be written out or held in your portfolio for extensive time periods (see why here). 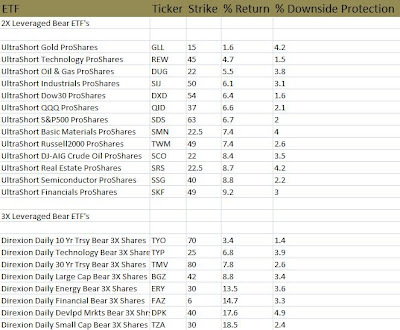 Of these 19 Buy/Write option strategies the ones that look most attractive to me are the short financial ETF's such as the UltraShort Financials ProShares (SKF) and the Direxion Daily Financial Bear 3X Shares (FAZ). The reason for this is because I think the financials are much over bought and will experience the greatest downside. The top daily holdings for the FAS (the Direxion 3X Bull Financials, inverse of the FAZ) are: JP Morgan (JPM), Wells Fargo (WFC), Bank of America (BAC), Goldman Sachs (GS), Morgan Stanley (MS), Bank of NY Mellon (BK), US Bancorp (USB), and American Express (AXP); and if you look at the table below you'll see that these 8 stocks have moved an average of 136.7% since the current market bottom on March 6, 2009. Unlike the FAS, the FAZ does not have an easy to understand daily list of holdings, but it seeks to return 3X the inverse of the basket of financials in the FAS. And as the table above shows these top holdings have had massive gains since March 6, and assuming the market has a slight correction (I can see the S&P 500 down to the 850 range, the Dow down to the 8000 range, and the NASDAQ down to the 1680 range), I believe the financials will experience the greatest pull back. However the Buy/Write option strategy gives you downside protection as well in case the market gains in the coming 10 days. If the market moves more or less sideways this is also a winning strategy, as these leveraged ETF's have large time values which will deteriorate closer to the option expiration. If you're more bullish/bearish you’ll want to adjust the strike price accordingly. If you’re even more bearish, write further out of the money calls; you won't have as much downside protection, but you'll give yourself a greater possible return. This strategy is a great way to hedge your portfolio and could return a large gain in just 10 days. Option volumes have exploded over the past 5 years because it is a great way to hedge your portfolio (see chart here). For your convenience I have ranked these leveraged ETF's by % Return in the printable spreadsheet below (click image to enlarge). With just 10 days left until the option expiration, I have crunched the numbers on some of the most popular leveraged ETF's and it looks as if they're getting some summer heat. I am the first to admit that I think these ETF's are only for traders (and are an investor's nightmare), but they are so volatile, and bring such great premiums, it is hard for a trader of options like me to resist. A very short hold of 10 days could yield you a nice return considering it is only for ten days (crunch the numbers on an annual basis). I have developed several strategies with these leveraged ETF's which seem to return steady profits month after month, and I usually wait to implement them within the 2 week expiration period. This analysis requires the knowledge of options. 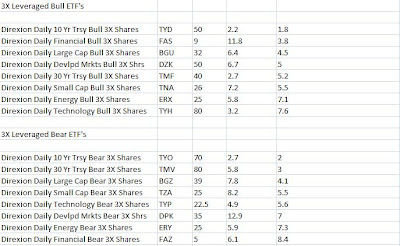 These would be returns based on the buy/write option strategy (as of market close Monday July 6, 2009). To gain a better understanding of the buy/write option strategy and options in general check out my stock options trading E-Books for sale on this blog. For this analysis I used a rather bullish approach on both the bear and the bull ETF's to gain a higher return (assuming the ETF expires above the indicated strike which is unlikely but very possible) and a lower downside protection. If using any of these ideas, you will most likely have to adjust strike price and expiration according to your opinion. Strike Price: The price I chose for the ETF to close at or above at expiration in order to sell the stock (stock sold at strike price). % Return: This is how much the position would return (less commissions) if the stock were purchased at beginning of trade and the indicated option immedietly sold, and the stock closed at or above the indicated strike price as of July 18, 2009 (option expiration). % Protection: This is how much the stock could go down before you start losing money on the position. From the list above I am most interested in: (UCO), (SCO), (SRS), (SMN), (ERX), (TNA), and (TZA). 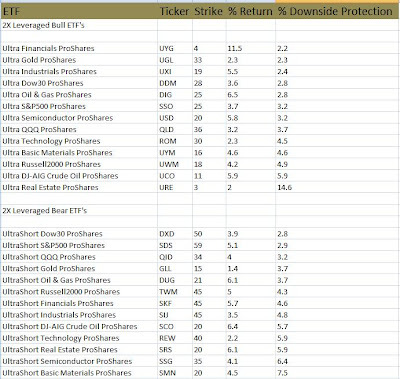 These leveraged ETF's are among some of the highest return % if called out and offer good downside protection. Many of these are the bears which is another reason I am interested in using them as my portfolio is about 80% long positions, and this will help reduce my risk. Any of the ETF's listed in the above table are much more safe and investor friendly, however if you are a trader and seeking premium it would be in your best interest to keep an eye on some of the leveraged ETF's mentioned in this article. To get more information about trading options check out my E-Books. 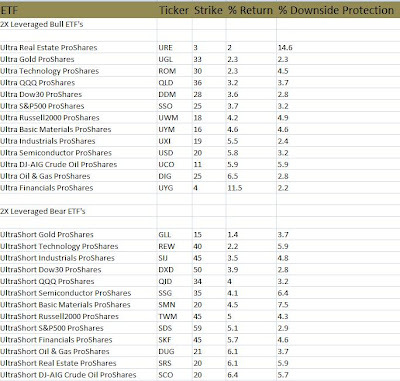 For your convenience I have put together printable spreadsheets of both the 2X and 3X leveraged ETF's ranked from least to greatest % Return and % Downside Protection below.